The teacher is available for for either Psi-Qi-Force awareness development and for 'water'-flowing health/martial-instruction. 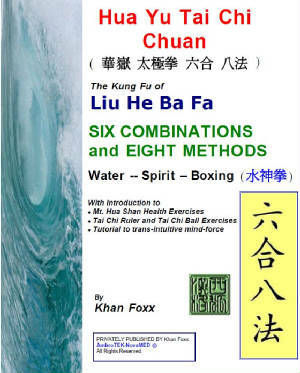 Instruction has been given to visiting teachers from Europe, Asia, and America for water-style boxing as it relates to the more recent variations and adaptations made upon Liu He Ba Fa; instruction is also available on Yi-chuan, Qi-Gong and how each complements the water-style. Group seminars have previously been given to students of the Yao Yi-chuan school, Poland, and to a groups of select medical practitioners. The content of this website http://waterspirit6x8.tripod.com/ is listed and praised in the online encyclopedic reference Wikipedia. (It should be noted that each entry within the Wikipedia resource differs in content and interest depending on its authoring, language, and subject: liu he ba fa, liu ho ba fa, lok hop pat fat, and water-boxing.) Content also differs upon the whim of entrenched, wiki editors who presume that their knowledge will prevail and preact to deny file editing. >only directly from the author.